The latest in vaping from IJOY is the Saber 100W Starter Kit with Diamond Sub-ohm Tank. This pen-style vape kit is compact in size but not performance. It uses a single 20700 battery that is 3,000mah of power and vaping enjoyment. The Mod potion of this kit has a max wattage of 100W and a resistance range of 0.05-3.0ohm. It has an OLED screen and is firmware upgradeable using the USB charging port. It uses an IWEPAL chip as a safety precaution to help with low-power protection, short-circuit protection and anti-reverse protection as well. IJOY Diamond Sub-ohm Tank has a whopping 5.5ml capacity thanks to its bubble glass tube. 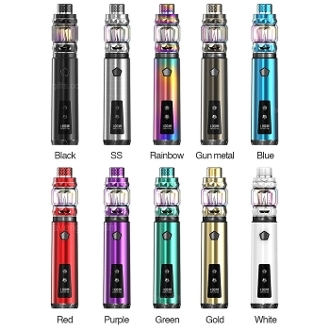 You are also able to adjust your tank size to 4ml by switching to the normal glass tube or 2ml by using a TPD version. It uses 2 styles of Coils; the DM-Mesh Coil 0.15ohm which comes pre-installed and the DM-DM Coil 0.15ohm. Both have a recommended wattage range of 40-90W.